Some exciting news coming down the pipeline from Warner Bros Interactive Entertainment this yesterday afternoon concerning DC Comics latest video game venture, Injustice: Gods Among Us. Injustice is a fighting game developed in the same vein as Mortal Kombat and in fact is being produced by the studio who brought us Mortal Kombat and Mortal Kombat vs. DC Universe, NetherRealm Studios (formerly known as Midway). The game is now set to be released on April 16th, 2013 here in the states for the Playstation 3, Xbox 360 and Nintendo’s Wii U game consoles. European gamers will have to wait 3 more days. Along with a release date we received news and images concerning two collector’s editions. The first one is a bit smaller in scale; it includes the game disc, a special collector’s statue featuring Batman, Wonder Woman and Superman’s Fortress of Solitude and Escape Rocket, a collector’s edition of the Injustice: Gods Among Us comic book, three exclusive skins of New 52 Batman, Superman and Wonder Woman, and a digital download for the DC animated release, Justice League: Doom. This set will retail for $99.99. The second collector’s set is known as the “Battle Edition” and is only available in “limited quantities” through participating Gamestop and EB Games locations. 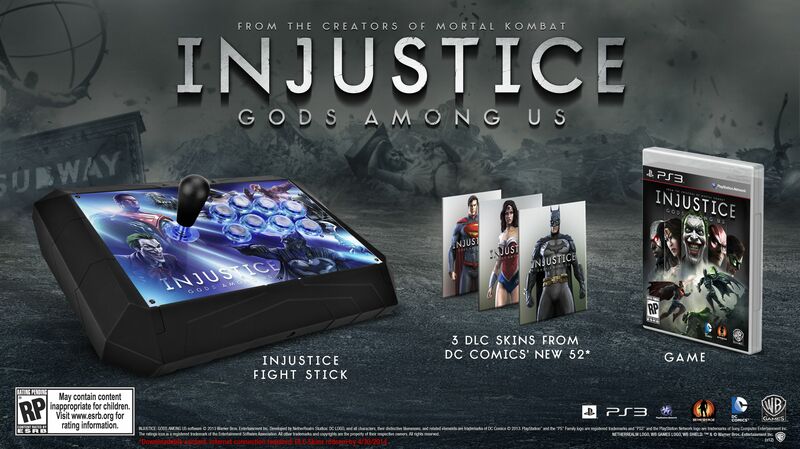 Instead of the statue this set will include a Fight Stick featuring art from the game (Superman, Batman, Wonder Woman and The Flash) as well as 3 extra skins, the Injustice: Gods Among Us comic book and the digital download.The fight stick is described as “a lightweight controller that boasts a non-skid foam underside, a lockout feature for the Start, Select and Guide buttons, as well as adjustable illumination for the buttons and joystick.” This set will retail for $149.99. Of course you could always skip all the bells and whistles and go for the basic copy which retails for the normal price of $59.99. All of the extras really seem to be geared towards fans of the Trinity (Superman, Wonder Woman, and Batman) and if the Flash weren’t featured on the Flight stick I wouldn’t even be considering the purchase of the Battle edition. Even the preorder bonus from Gamestop is focused on Superman and the Red Son storyline. 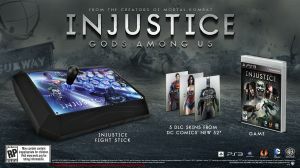 Essentially if you preorder from Gamestop you get three exclusive skins (Superman, Wonder Woman and Solomon Grundy??) and a bonus story mode based on Red Son as well. I know that I’m not the target audience for stuff like this but don’t we have enough stuff featuring the Trinity? I just hope we get some decent alternate skins for the rest of the cast as well. 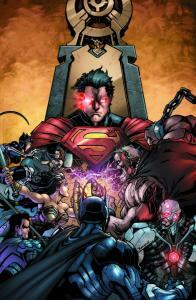 In addition to the release date news DC has released the first chapter of Injustice: Gods Among Us, the comic book digitally yesterday. The comic is available at ReadDCEntertainment.com, through the DC Comics App, Ibook, Kindle, and Nook online stores. A chapter will be released every Tuesday for $.99 and three digital chapters will then be collected into a print collection that will be available for sale monthly. The comic will be a prequel to the game and will explain why the heroes are fighting among themselves. My personal experience with such things has been disappointment after disappointment. I personally have learned never to trust a comic that is based on a game. But for those who are brave, please let us know how you dig it. 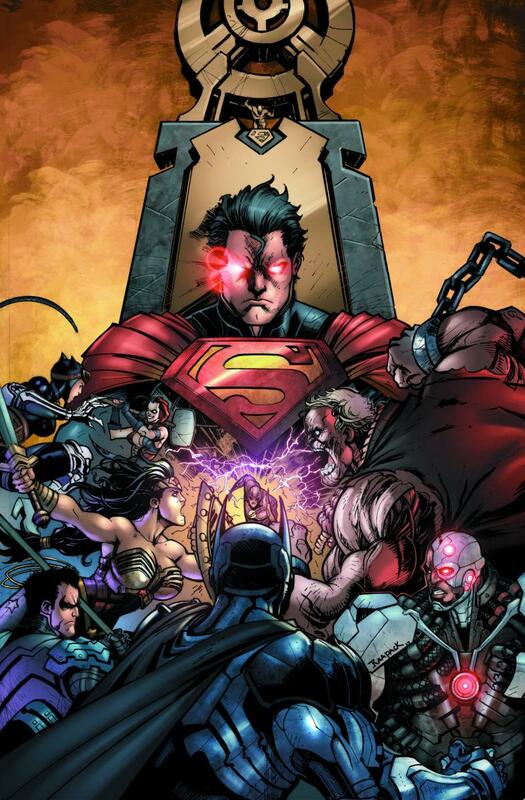 So who still plans on picking up Injustice: Gods Among Us after the recent announcements? Anyone plan on taking the plunge and getting the Collector’s or Battle editions? Please let us know in the comments below. This entry was posted in Media, Timely and tagged Barry Allen, Batman, Digital Comics, Flash, Gamestop, Injustice: Gods Among Us, Mortal Kombat, Mortal Kombat vs. DC Universe, Netherrealm Studios, Playstation 3, Superman, Video Games, Wii U, Wonder Woman, X-Box 360 on January 16, 2013 by Devin. Really looking forward to this game! I still play MK vs. DCU, quite often. Have they said yet whether it’s Captain Cold or Mr Freeze in the game? 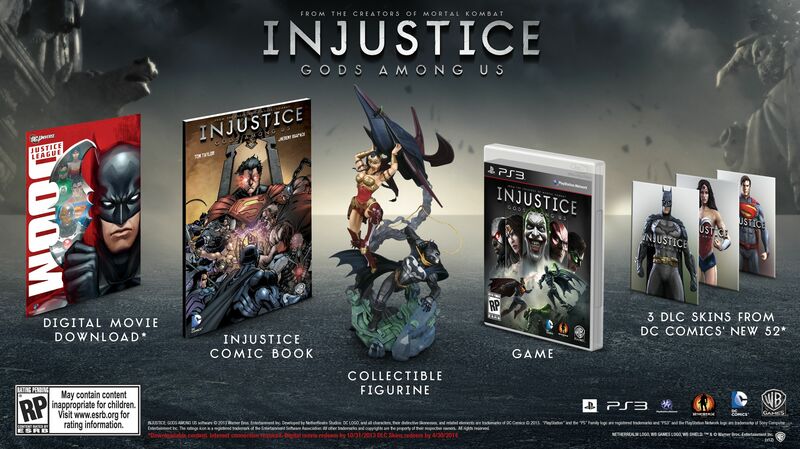 I’m seriously considering getting the edition with the statue and getting it at Gamestop to get the Red Son levels. I did buy the first issue of the comic digitally, and while you can tell where it’s leading, I still enjoyed it a lot actually.